This is an important posting to inform you of a consultation on Housing in Horndean, and how you can give your view. Housing is going to be built at an increased rate in our community to cope with increased demand. For Horndean this means 1190 new homes between 2011 and 2028 (79 new homes or a 1.5% increase a year). It is essential that we ensure we get the right houses in the right places with the right facilities. To achieve this we (the 5 District Councillors in Horndean) have asked the District Council to organise a consultation to get your views on where the residents of Horndean would prefer housing to be built, the type of community facilities we might ask of developers, and the areas we should work to protect. 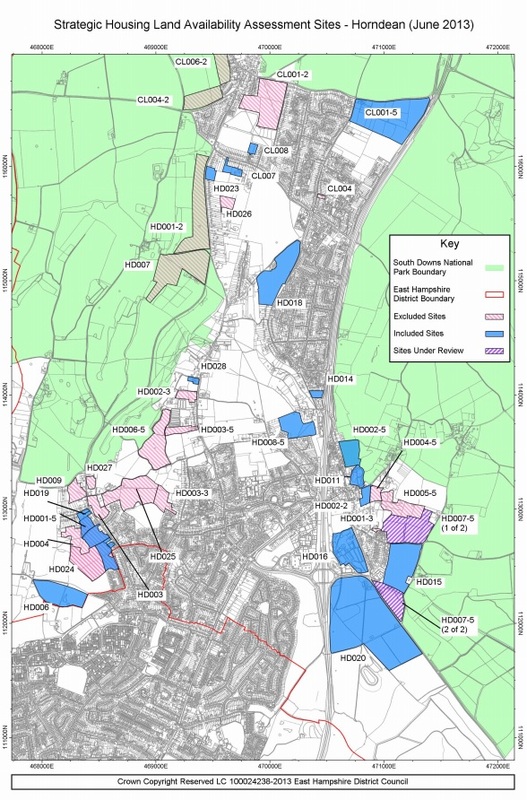 This is also being supported by Horndean Parish Council who view this as the quickest and most effective way to help establish some of the safeguards a neighbourhood plan might achieve against building in the wrong places. 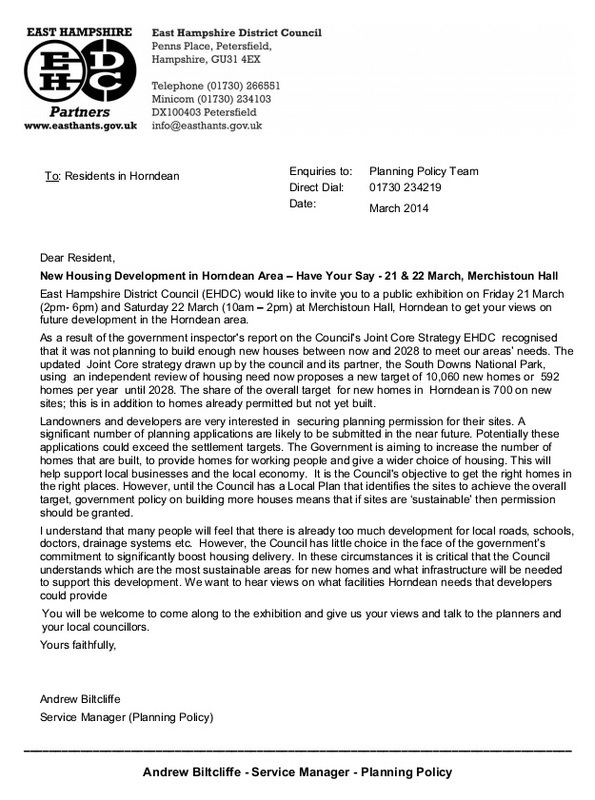 This consultation be held at Merchistoun Hall, 106 Portsmouth Road, Horndean on Friday 21st March from 2pm to 6pm and Saturday 22nd March from 10am to 2pm. There are many things to be considered and your views are being sought to provide evidence for consideration at planning meetings about what the community’s views are. 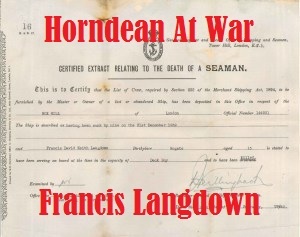 • Is it important that the villages of Lovedean, Horndean, Blendworth and Catherington retain their own separate identities and do not merge in together even more, or with adjacent communities to the North and South? 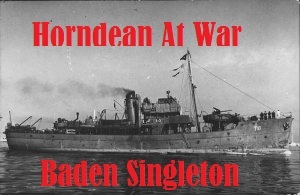 • How important to you is the semi rural feel of Horndean and do you wish to retain this by keeping our strategic gaps and landscape views? • Are there areas where you think housing could be accommodated that would do least harm to the nature and feel of the Parish and its residents? • Are there areas where you think housing would damage our Parish, its nature, its environment and landscape and what matters most to you and your family, which you therefore consider to be completely unsuitable? • What sort of housing would be most satisfactory and how should it look? • Is minimising increases in traffic through Horndean centre a major consideration when siting new developments? Along with larger housing developments comes the opportunity to obtain from the developers not only contributions to roads, schools etc when these are necessary but also other facilities designed to suit the needs of the particular neighbourhood and the community at large. The scale of these will match the scale of developments and could therefore be quite significant. We are therefore also particularly interested to hear your thoughts on the desirability of such things as Allotments, A Gym, Ball Games Courts, Football pitches, A cricket pitch, A sports pavilion, A community building, Children’s play areas and so on. The consultation will be run by officers from East Hants District Council but District Councillors also will be on hand to explain and answer any questions you may have. We very much hope you will be able to come along to this consultation and contribute to the ideas about how our community should develop over the next fifteen years and beyond. 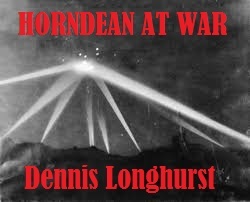 So you can give this some thought in the mean time, please find below a copy of the current SHLAA Sites in Horndean. Please let your friends and neighbours know. Perhaps Hazleton Farm would be ideal for Travellers? I went to the ” con ..sultation” and came out with the impression that it is a done deal. The reps were telling us what the builders are going to do.Not what they would like to do if given the opportunity. They had no real answers to any of the issues that were raised with them,ie infrastructure,road conjestion,impact on nature etc, because they are not interested. The meeting seemed to be an insult to so called democracy. They are just going through the motions. They have no interest what so ever in the concerns of the local population who the builders and EHDC seem to be treating with contempt. Hi, Feedback from a lot of people was that Taylor Wimpey were putting it about that the development was going to happen, and the forms were very leading and gave the inference there was little opportunity to raise serious objections to this. I agree that the quality of the consultation was poor, and one of the least informative and most inaccurate I have seen. I also agree that their interest in the local community is low as their objective is to get a profitable development site if they at all can. I am truly concerned if you think EHDC are treating the local population with contempt and would appreciate knowing why you feel this? Hopefully you have seen from the pages of this blog that local Councillors and EHDC feel the landscape value of this site is of great value to the community, and we are holding a consultation (Merchistoun Hall 21st, 22nd March) to form an allocation plan to help protect the local sites that are valuable to the community. Please do let me know, Guy. Thankyou for your quick reply to my mail. Please accept my appologies with regard to my statement concening the integrity of E.H.D.C. This was in no way meant as a negative comment about you and your fellow councillors but rather a case of mis information being passed to me. I have since addressed this issue. I continue to support your stance and look forward to further updates concerning this issue. As an additional thought. Is there any mileage in looking at the brown field site adjacent to Morrisons. A lot of those units seemed to have been empty a long time. Just ripe for redevelopment.